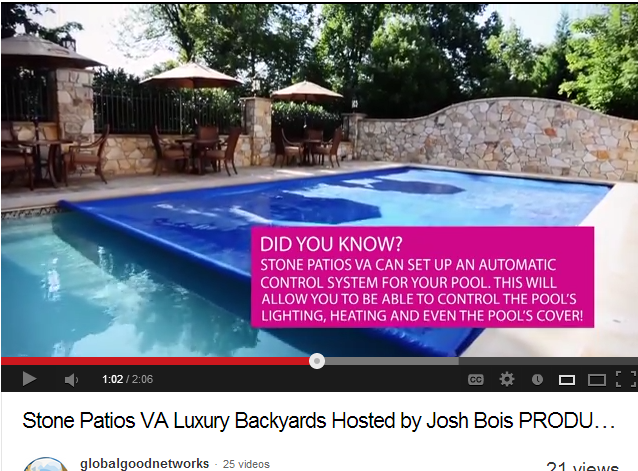 Recently our founder Josh Bois hosted some videos for G.H.A.’s partner companies Stone Patios VA, Upscale Remodeler / Sterling Design and Construction, along with Roofing Siding VA. Within these videos you can see some beautiful work we have provided to some of our East Coast clients in the Northern Virginia area, Reston in particular. If you watch closely in the first video you will see some cool shots of the pool cover closing over the pool automatically. For this particular client we installed an easy to use outdoor switch they can flip to have the pool cover automatically be covered or uncovered. This helps to keep their pool clean while usable at the same time. Above and beyond just the automated pool cover we also installed an automatic pool cleaning robotic system that rolls all throughout the bottom of the pool to clean any debris that has landed in the pool to keep it clean and sanitary. For this particular client our contracting partner, who is also a part of Global Home Automation, designed and built the entire back yard including all of the stone walkways, patios, the pool, the outdoor home room addition, the metal railing and more. The pool’s design and construction was also something our partner handled for this client. All together this was a $250,000 backyard including the gardening services that were provided. This client was so happy with our work that they had no problem allowing us to do a full day of filming there because they are so in love with the back yard we have built and automated for them! Call us or e-mail us with any of your feedback we would love to hear it. If you are looking for a home automation quote anywhere in the world give us a call so we can line up a meeting for you with one of our contractors! See some interior shots of the home as well, which also features some networking, speaker, and intercom automation. Sneak in some shots of the roofing and siding on this house that we also showcased!